Nobody is going to dedicate as much time and effort towards the success of a business as its owner. That doesn’t mean, however, that the average employee isn’t expected to pull their own weight. Given the connected nature of today’s on-demand, instant gratification society, staying focused at work can be a real chore – even for good, honest people. After all, if you’re on the clock and not being productive, that’s called stealing. It’s this issue and others that Microsoft’s latest Office 365 add-on aims to address. Microsoft Workplace Analytics is a powerful organizational analytics solution that provides managers and other higher-ups with behavioral insights that can be used to boost productivity, employee engagement and workforce effectiveness. As Workplace Analytics General Manager Ryan Fuller explains, the tool taps into Office 365 calendar and e-mail metadata such as subject lines, timestamps and to/from data – cleverly called digital exhaust – to gauge how an organization collaborates and spends time. Fuller says Microsoft designed Workplace Analytics with built-in privacy and compliance features, pointing out that it only leverages metadata that is aggregated and de-identified. Furthermore, customers own their Office 365 data and can decide how to apply the insights generated by the tool. The add-on isn’t just about weeding out dud employees or hopelessly trying to motivate those with zero drive. Analysts can use the tool to see how much time is spent working on e-mail or in meetings and even determine the size of an employee’s internal network. For example, managers can use the tool to study the behaviors of top-performing salespeople and scale those techniques across the entire sales department. Similarly, an organization can look at the effects of 1:1 meetings between employees and leadership to gauge whether investments of time are paying off. Elsewhere, HR teams could determine if relocation would save on travel time by analyzing calendar metadata from booked meetings. Even Microsoft is using the new tool internally. Kathleen Hogan, chief people officer at Microsoft, said their HR Business Insights group is using Workplace Analytics across a variety of initiatives—from understanding the behaviors driving increased employee engagement to identifying the qualities of top-performing managers who are leading Microsoft’s cultural transformation from within. Hogan added that they believe people analytics is a competitive necessity for any HR team. As rings true with many aspects of our lives (think finances, relationships, diet, etc. ), simply paying attention to what’s going on can save time and money like you wouldn’t believe. There's little reason to believe that fine-tuning a business with a tool like this wouldn't pay dividends. 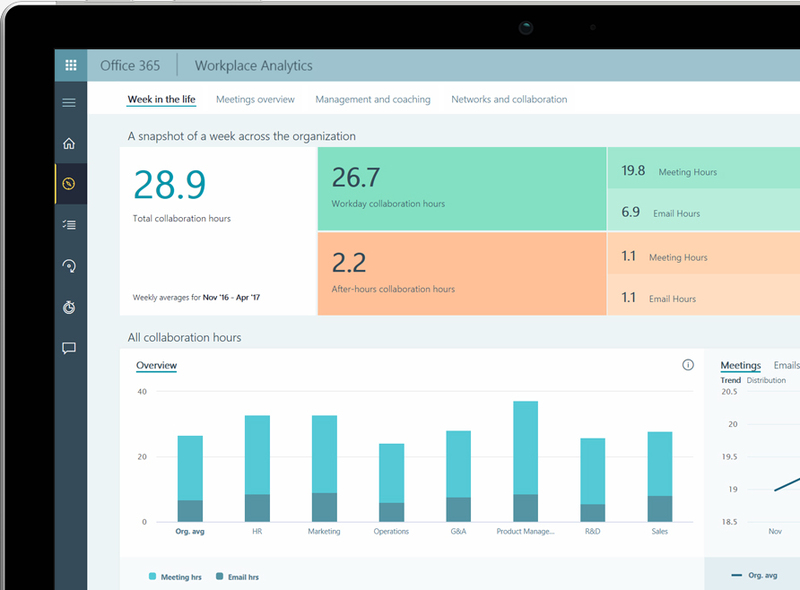 Microsoft’s new Workplace Analytics tool is available as an add-on to any Office 365 enterprise plan.